Ex Works is a delivery term, which is defined under Incoterms 2010 rules as follows "Ex Works” means that the exporter delivers the goods to the importer when exporter places the goods at the disposal of the importer at the exporter’s premises or at another named place such as exporter's warehouse etc. 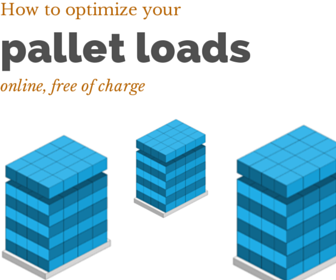 According to Ex Works delivery term, the importer must collect the goods from the exporter's place, load the goods to the carrying vehicle, arrange the transportation, pay for all freight charges and make the custom clearance, not only import customs clearance but also export customs clearance as well. EXW can be used with all modes of transport. 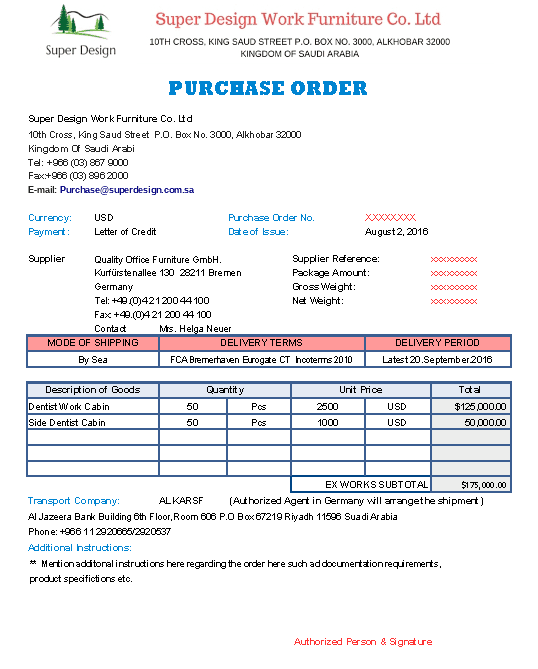 As an importer, if you are willing you prepare a purchase order with Ex Works delivery term, you can use our free Microsoft Excel Template. Free Carrier is a delivery term, which is defined under Incoterms 2010 rules as follows “Free Carrier” means that the exporter delivers the goods to the carrier or another person nominated by the importer at the exporter’s premises or another named place. 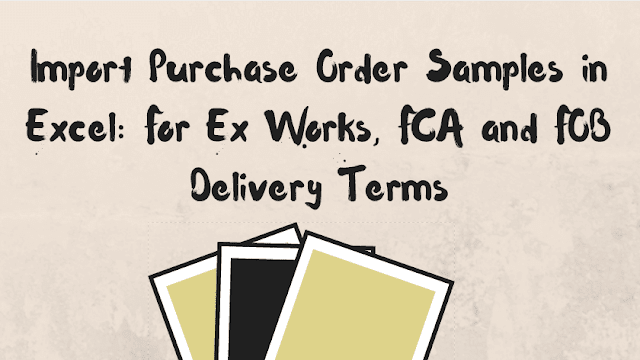 FCA can be used with all modes of transport. 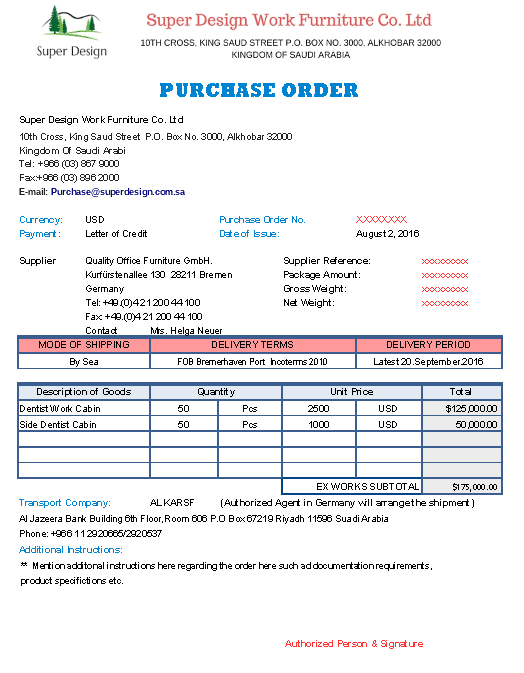 As an importer, if you are willing you prepare a purchase order with FCA delivery term, you can use our free Microsoft Excel Template. FOB is a delivery term, which is defined under Incoterms 2010 rules as follows “Free on Board” means that the seller delivers the goods on board the vessel nominated by the buyer at the named port of shipment or procures the goods already so delivered. FOB can be used only in sea shipments. 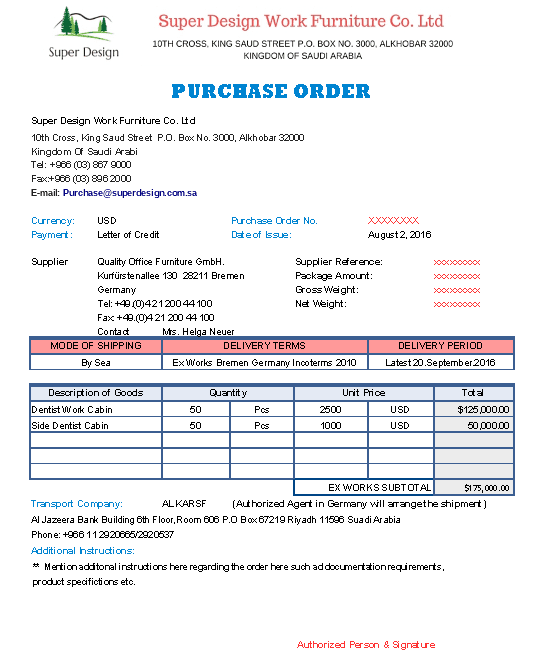 As an importer, if you are willing you prepare a purchase order with FOB delivery term, you can use our free Microsoft Excel Template. What are the differences between proforma invoice and commercial invoice?